Every time a user enters a search query, businesses are presented with an opportunity to engage with a potential customer, earn their trust, and in turn their business. This can be done by utilizing the paid search marketing services that these search engines offer; the business’s ads appear when the appropriate matching keywords are looked up. The big questions on your mind now are probably regarding costs and how much of a return you can expect on your investment. How can we as marketers present our products and/or services to these potential customers, while competing with others in the same industry trying to do the same thing and work within the limits of our budget constraints? Google AdWords is a program that allows marketers the potential to reach to a large digital audience. The beauty of Google AdWords is that you do not need to have a large advertising budget in order to succeed. Although an ad may be displayed, the marketer is not charged unless the ad is clicked. Hence the name, pay-per-click (PPC). 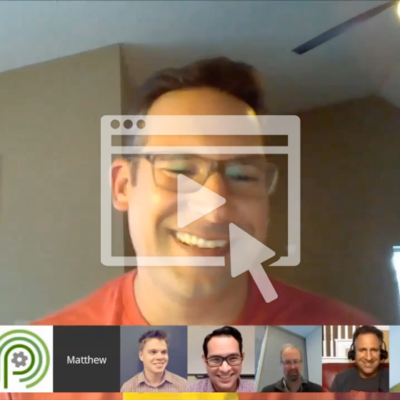 Google AdWords is a meritocracy and your campaign successes are a reflection of how good the content you are advertising is, as well as how much you are looking to invest. Since Google AdWords only charges for the click of the ad, businesses can achieve good results even with a small budget. With relevant good content, ad copy and good choice of keywords, businesses can ensure a good click-through rate (CTR). Those who click the ad are likely more interested in the business’s offer and as such, are more likely to become qualified leads. With cost-per-click (CPC), since you are only paying for visitors most likely to convert into leads, your business can significantly lower its cost-per-acquisition (CPA; the cost of acquiring a new customer), and consequently increase its ROI. Let’s pause and think for a moment what it’s like to search for information. When you search for something, you want to be delivered something useful and not be bombarded by irrelevant advertising that does not pertain to you. Google understands this and wants to make the user experience as enjoyable as possible. This means that ads presented by Google will be ones that look like it’s natural for them to appear; no awkward ads like shoes when you are looking for pizza delivery. How does Google achieve this? This has to do with how Google decides which ads to present every time a user performs a search query. Every time a search request is made, there is actually an auction for the keywords that the user typed in. From the marketers’ side, every ad they will have has its own set of keywords. These are what they are bidding on for those ads to appear. 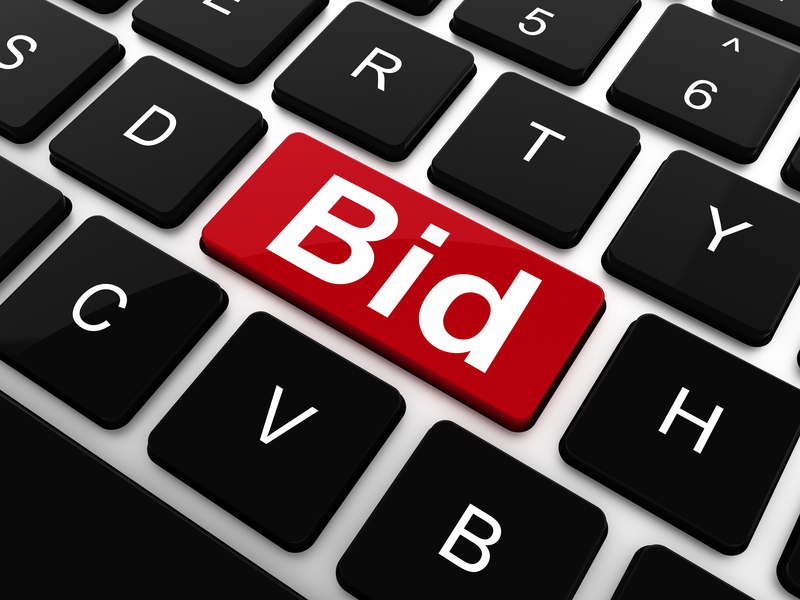 However, Google’s auction system is a little more complicated than your traditional auction. Aforementioned, it’s not just about who has the most dollars; the quality of the content you’re showing matters as well. Let’s take a look into how Google takes both bidding and quality of content into account. What do all of these factors have in common? They make things easier for the user! When a visitor reaches your landing page by clicking your ad, they want to find exactly what they are looking for, and being relevant as well as making the browsing experience a pleasant one is something that Google wants to ensure. After all, they wouldn’t be the world’s leading search engine if they couldn’t deliver good results! 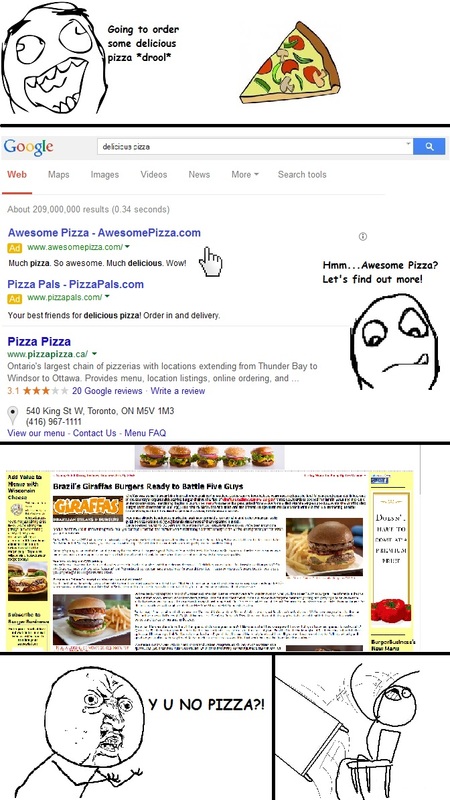 For example, if you were to look up “specialty pizza restaurants in Toronto”, you would not be very impressed by an ad that took you to your nearby burger joint. As a user, you might be upset by the blatant bait and switch, or, if you already knew it wasn’t a pizza restaurant, you may not even bother to click. This affects marketers negatively by either costing them for clicks that don’t convert or their landing pages may result in having low click through rates. On the other side of that coin, assume that as a user, you search for the same thing but were presented with an excellent pizza restaurant that opened recently, a few blocks down, with great reviews. You will be happy you discovered it, and the business is happy they were discovered, as they now have a new potentially regular customer. To facilitate this pleasant experience even further, Google’s auction system takes into account the quality score of your ad into account, along with your maximum bid in order to generate an Ad Rank. Based on Ad Rank, the highest scores of those ads with matching keywords will appear in order whenever a user does a search query. 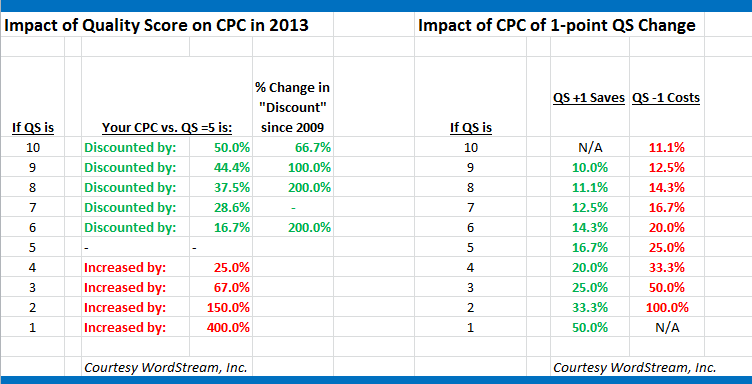 As stated before, the actual amount you pay (actual CPC) is not the same as what you bid, your max CPC. Your max CPC simply puts a ceiling to the most you are willing to pay for those clicks. 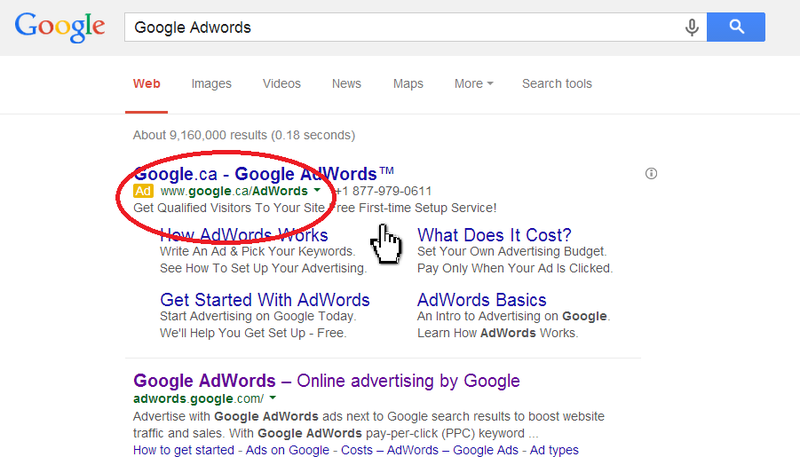 With Google Adwords, you only need to pay just enough to outrank the next person below you, which means $0.01. To calculate how much you would pay, you simply take the rank score of the person ranked right behind you, divide it by your quality score, add $0.01, and that is your actual CPC. This means that every time your Quality Score goes up, you can expect a significant savings to your average advertising costs. As you can see, it is very possible to advertise using PPC at a significantly lower cost if you manage your quality score. As mentioned previously, there are several factors that Google uses in order to calculate your Quality Score and they all involve making the browsing experience useful and convenient to users. To achieve this, there are two major aspects that advertisers need to focus on: the quality of the landing page as well as the quality of the ad. Regarding the page itself, we need to make sure that when a visitor lands on the page, they can easily navigate the page and find useful information. This means ensuring that the information presented can answer your users’ query, is displayed in an organized manner and on a site that is easy to navigate. 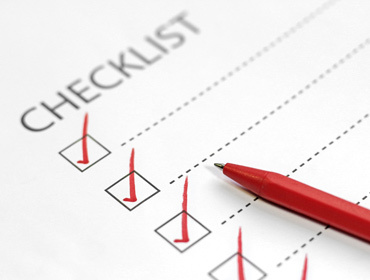 The most frustrating thing for any visitor is to land on a page with irrelevant information and little to no indication as to how to find the information they are looking for. When it comes to the ads themselves, choose a good title and description for the copy that catches the eye of users. Simple phrases and symbols that get the message across are particularly effective. Having the relevant keywords in your title and/or description will greatly increase the relevancy of the ad to the query. Make sure that the ad is also part of the correct ad group; AdWords groups different ads into the same ad group so that advertisers can rotate ads that are displayed whenever a relevant keyword is searched. It is important that your ad is relevant to the overall ad group, as doing otherwise can negatively affect your Quality Score as well as being ineffective for monitoring what campaigns are performing well. Over time, as your quality between both your ads themselves as well as your content improves and meets Google’s expectations for high quality and relevancy, your historical performance on your URLs and your account overall will naturally improve, further helping your Quality Score. While managing your quality score can greatly provide savings based on AdWord’s auction system, this should still be a standard practice for businesses. Even if your business was able to get its ads displayed through AdWords quality control and have users click using bait-and-switch methods, it would not benefit your business. Being irrelevant to the user will leave them with a bad taste for your business and you would have paid for a click that did not convert. Instead, understanding how your business can be more relevant to users in the eyes of Google is a more effective method to provide your business solution to potential customers and they will thank you for it.